To commemorate the beginning of the Civil War in 1861, Fold3 is providing free access (with registration) to our Civil War Collection from April 1–15. This collection currently has 50 titles, with more than 91 million records, so if you’re looking for information on the Civil War veterans in your family tree—or doing other Civil War-era research—now is the perfect time to explore these records on Fold3. Can’t find your Civil War ancestor on Fold3? You can still use Fold3 to learn about what your ancestor’s military service may have been like. Here are a few ideas, though the possible uses of the Civil War Collection are endless! 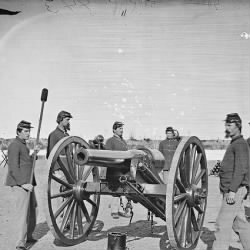 Use the Brady and Civil War photo collections, as well as the Civil War Horse Soldier Artifacts Collection, to learn what life was like for soldiers during the war, including what uniforms and firearms were common, what military camps and headquarters were like, what battlefields and forts looked like, etc. Look through the Service Records and “Widows’ Pensions” of men who were in the same company, regiment, etc., as your ancestor to learn more about what battles he may have been involved in and the movements of his unit. If you have Confederate ancestors, explore the Confederate Casualty Reports for your ancestor’s unit to learn about casualty rates and even read narrative reports of actions your ancestor may have been involved in. Get started searching or browsing Fold3’s Civil War Collection!